A Team Van Oord flood protection project covering an area of outstanding natural beauty within the Severn Estuary has been awarded a prestigious national accolade. The Stolford Flood Defence Scheme, completed in 2018, is being recognised through the Considerate Constructors Scheme (CCS)* National Site Awards. Winning a National Site Award is an exceptional achievement only given to sites that have made the greatest contribution towards improving the image of construction. Only the top scoring registered sites are potentially eligible to win a Bronze, Silver or Gold award – and Team Van Oord will discover which award has been given to the Stolford scheme at a ceremony in London on 4 April. The scheme at Stolford featured the deployment of block revetments, as developed in the Netherlands, instead of the conventional rock revetment approach – to provide an affordable solution to a long-term problem. 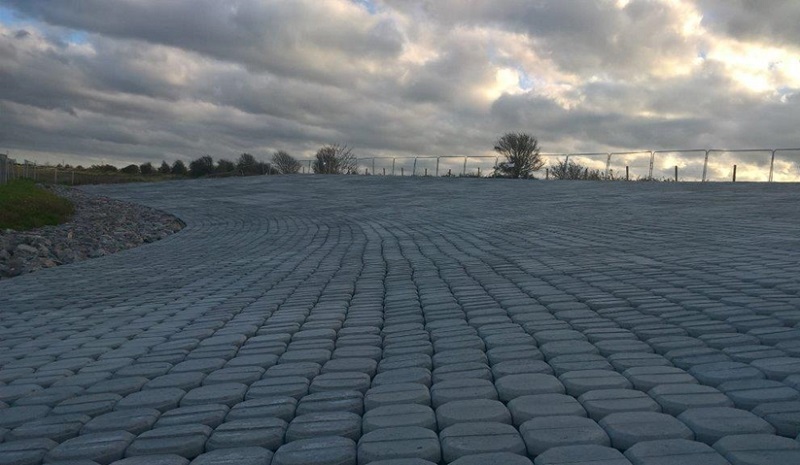 Hillblock, as it is known, is an innovative revetment block that varies in size from 200 mm up to 700 mm. Due to the shape and configuration of the voids, when placed together there is a significant reduction in the impact of energy from waves and wave run-up of up to 30%, compared to other types of shore protection. CCS was founded in 1997 by the construction industry to improve its image. Construction sites, companies and suppliers voluntarily register with the Scheme and agree to abide by its Code of Considerate Practice which focuses on three main categories: the general public, the workforce and the environment.